The Model "M30" was the hobby ceramic industry's original slip casting machine. It was designed and introduced in 1965, and with several improvements and updates, the current version remains the flagship model of Lehman. 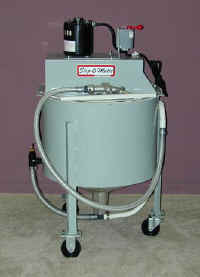 The Model RM30, shown right, has a unique reverse pumping action which allows for both the filling and draining of molds with just a flick of a switch. The utility nozzle easily controls the slip flow from a trickle to a full 5 GPM. The drain tube (attaches to the nozzle) is especially designed to draw in from the sides and will not harm the greenware. Also, by using the reverse action, the RM30 will fill itself simply by inserting the drain tube into any container of slip. The clear plexi-glass top covers help eliminate moisture loss and allow slip storage in the tank for weeks. The drive assembly has no bearings or seals exposed to the liquid and, as it turns, it gently mixes the slip and keeps it in ideal casting condition. The 30 gallon fiberglass tank has a steel frame with 3 heavy duty casters and it can be turned around within a 24" space. It uses a 1/3 h.p., 110 volt motor and the machine is shipped fully assembled and ready to be put to work. The RM30 has a diameter of 24", overall height is 45", height to top of the tank is 32" - shipping weight is 125 lbs.